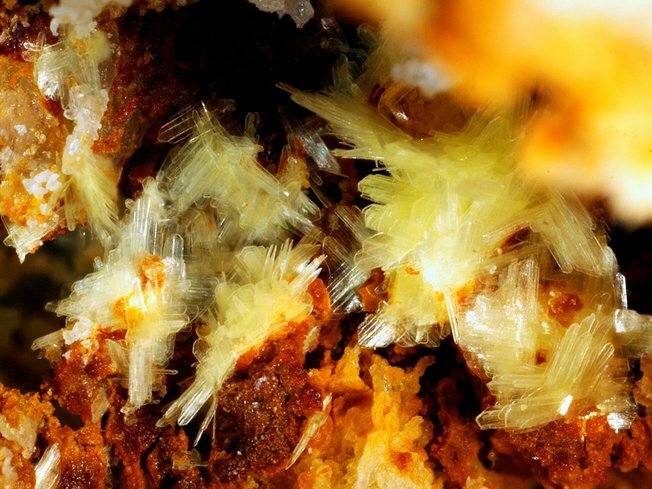 Chernikovite: Mineral information, data and localities. 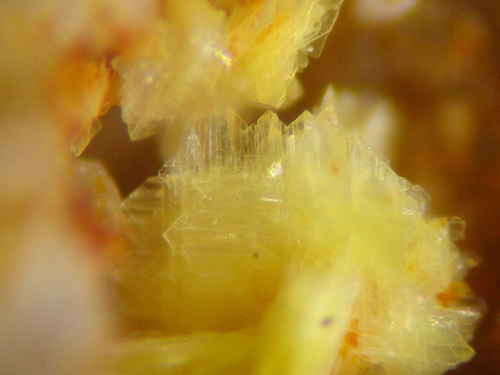 Synthethic material was known first, and referred to as 'hydrogen autunite'. Chernikov reported natural material in 1958, using the same name, but it was never approved by the IMA. The mineral was renamed in 1998 by Daniel Atencio in honor of Andrei Andreevich Chernikov (Андрея Андреевича Черникова) (b. 1927), mineralogist and geochemist at the Fersman Mineralogical Museum, Russia and an expert on uranium mineralization. 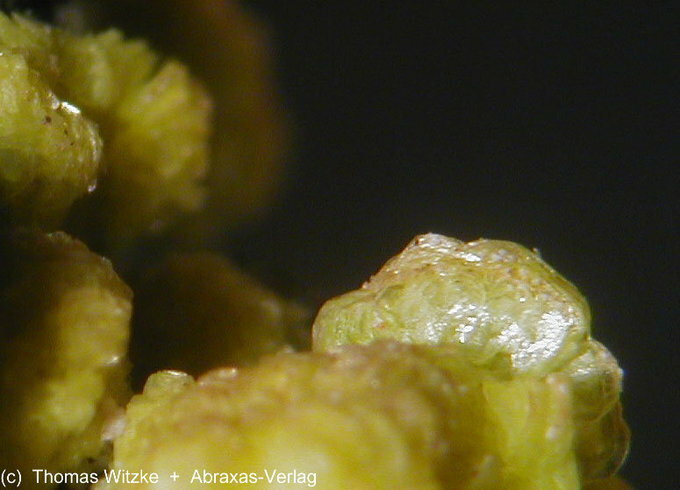 Meta-autunite Group. The most simple valid uranyl phosphate mineral. Compare 'UM1963-03-PO:HU'. Meta-autunite 2 photos of Chernikovite associated with Meta-autunite on mindat.org. Gypsum 2 photos of Chernikovite associated with Gypsum on mindat.org. Ross, V. (1955) Studies of uranium minerals (XXI): synthetic hydrogen-autunite. American Mineralogist: 40: 917-919. Chernikov, A.A. (1958) New data on some uranium and uranium-bearing minerals. Proceeds of the 2nd United Nations International Conference on the Peaceful Uses of Atomic Energy: 2: 298-299. Morosin, B. (1978) Hydrogen uranyl phosphate tetrahydrate, a hydrogen ion solid electrolyte. Acta Crystallographica: B34: 3732-3734. Atencio, D. (1988) Chernikovite. A new mineral name for (H3O)2(UO2)2(PO4)2.6H2O superseding "hydrogen autunite". Mineralogical Record: 19: 249-252. Van Haverbeke, L., Vochten, R., Van Springel, K. (1996) Solubility and spectrochemical characteristics of synthetic chernikovite and meta-ankoleite. Mineralogical Magazine: 60: 759-766. Jambor, J.L., Burke, E.A.J. (1989) New mineral names. American Mineralogist: 74: 1399-1404. Jensen, K.A., Palenik, C.S., and Ewing, R.C. (2002) U 6+ phases in the weathering zone of the Bangombe U-deposit: observed and predicted mineralogy. Radiochim. Acta: 90: 761-769. Mochnacka, K., Oberc-Dziedzic, T., Mayer, W., & Pieczka, A. (2012). Ore mineralization in the Miedzianka area (Karkonosze-Izera Massif, the Sudetes, Poland): new information. Mineralogia Polonica, 43(3-4), 155-178.; Mochnacka, K., Oberc-Dziedzic, T., Mayer, W., & Pieczka, A. (2015). Ore mineralization related to geological evolution of the Karkonosze–Izera Massif (the Sudetes, Poland)—Towards a model. Ore Geology Reviews, 64, 215-238.